High on mountains across Alaska, Canada, Europe and Russia near the upper tree line, even the hardiest of conifers are at the edge of survival. Their annual rings tell a story of extreme cold that limited their growth and of warmer years that allowed them to flourish. 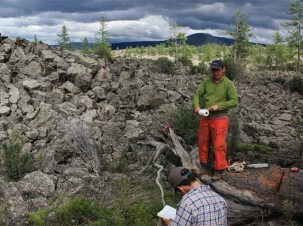 By analyzing pencil-thin cores from these living trees and fallen timbers, researchers have been able to reconstruct temperature changes through time in places like the Yukon and Mongolia. Now, a new international consortium of scientists is pulling this global knowledge together to bring the history of temperature fluctuations across the entire Northern Hemisphere to life. The N-TREND consortium—N-TREND stands for Northern Tree-Ring Network Development—was created to develop a global database of tree-ring research that improves on efforts for developing large-scale temperature reconstructions across the hemisphere. “This database is really important for a couple of reasons: It’s getting all of the most updated and longest published reconstructions for temperature, and, having done that, we can start to see where the holes are in the Northern Hemisphere in the data set,” said Nicole Davi, an adjunct associate research scientist at Columbia University’s Lamont-Doherty Earth Observatory and assistant professor at William Paterson University. Her current work is helping to fill in one of those holes, in Central Asia. Researchers take samples from a fallen tree in Mongolia. Credit: Neil Pederson. The consortium’s first research paper, appearing in the current issue of Quaternary Science Reviews, provides a view of past Northern Hemisphere temperature changes over more than 1,000 years, including additional records from early years. It reveals a longer and warmer Medieval period than previous temperature reconstructions suggested, from around 850 to the end of the 11th century, with a peak in the 1160s. It also shows how the two coldest decades—1812-1821 and 1832-1841, both during a period known as the Little Ice Age—are followed by near continuous warming to today. The new reconstruction matches the late 20th century instrument data more closely than previous reconstructions, the authors write. A second paper being developed from the database will look at spatial temperature variations region by region across the Northern Hemisphere. It could help answer questions about the spatial extent of Medieval Warm Period, for example. Recent studies have suggested that that warm period, so evident in Europe, didn’t extend to Greenland and some other areas. Such analyses will also help assess global climate models and could help attribute the forces behind temperature change. Rob Wilson, an adjunct associate research professor at Lamont and senior lecturer at the University of St. Andrews, along with Rosanne D’Arrigo and other current and former Lamont Tree Ring Lab scientists, launched N-TREND as a collaborative effort of the dendrochronology community to develop the best tree-ring research methods for reconstructing temperature changes over hundreds of years. Most temperature reconstructions for the Northern Hemisphere have combined multiple proxy archives of temperature records, sometimes mixing summer and winter seasons or non-annual records, which can increase their uncertainty and hamper their use for detecting short-term climate responses, such as responses to large volcanic eruptions. The N-TREND database is different. It focuses solely on published summertime tree ring reconstructions that go back to at least 1750 and only includes records from above 40 degrees North latitude to optimize the temperature signal. Since the reconstructions have already been published, they have been scrutinized at least once through a peer-review process. The paper in Quaternary Science Reviews takes a close look at some of the challenges of previous historic temperature reconstructions, explaining why reconstructions using multiple sources—such as tree rings and ice cores, or mixing winter and summer growth data—can end up with varying results. The paper also shows that the strongest climate signals in tree ring research are identified when using either maximum late-wood density—the dark part of the ring that develops late in the growing season—or a combination of ring width and late-wood density data. 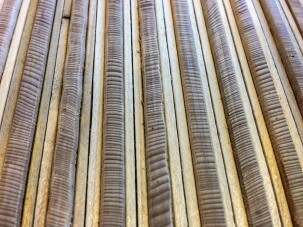 It notes that a new method for measuring maximum late-wood density, called blue light intensity, is making those measurements easier and more affordable, and that another tree ring research method using stable isotopes holds future promise in regions where ring-width or density may not express a strong temperature response. Reconstructions like those being developed by N-TREND are adding to the understanding of climate changes across the Northern Hemisphere. Last fall, Lamont’s Ed Cook and an international team of scientists released the Northern Hemisphere Drought Atlas, which tracked a different climate indicator recorded by tree growth: extreme dryness and wetness. The combination of drought atlases for North America, Europe and Asia is providing historic annual data about years of droughts and wet years going back over a millennium.